There are over 3 million apps in the Google Play Store — but which ones are the most popular among advertisers? 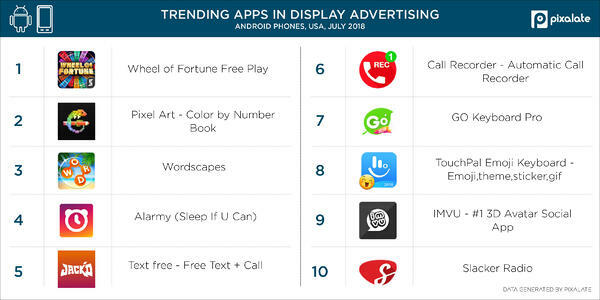 In addition to highlighting the top trending mobile apps on iPads and iPhones, we’ve examined data from official Google Play Store apps to identify the latest mobile advertising trends in the Android app ecosystem. 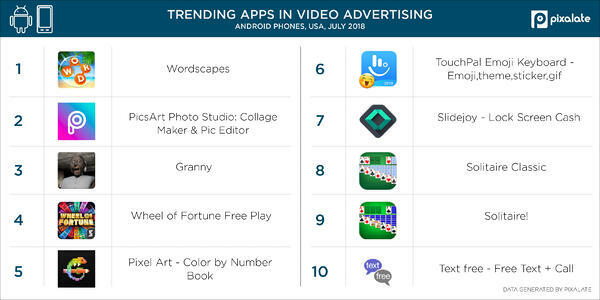 This post highlights the top trending apps in the United States, based on display and video programmatic advertising volume, on Android phones from July 2018. Pixalate examined mobile in-app display advertisements sold via programmatic channels throughout July 2018 for this study. The data is based on activity within apps that engage in programmatic advertising in the open marketplace. Invalid Traffic (IVT) — including General Invalid Traffic (GIVT) and Sophisticated Invalid Traffic (SIVT) — were removed prior to ranking the apps. Any reference to "top" or "trending" apps refers solely to an app's Share of Voice of programmatic advertising impressions.